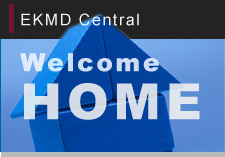 For all EKMD services please enter your username@ekmd and password when prompted. PDA and 3G cellular phone users can access the home (H:) folder for READ ONLY purposes. We welcome your comments as an opportunity to improve. Kindly refer all issues to helpdesk@ekmd.huji.ac.il or open a service ticket at our CallMe site: http://callme.ekmd.huji.ac.il . 2007 © The Hebrew university of Jerusalem. All rights reserved. Last update: 01/05/2011. Design: The EKMD team.